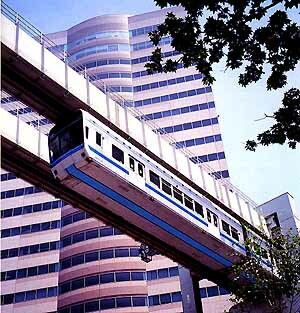 The Chiba City "Townliner" is currently the longest suspended monorail system in the world, and it is getting longer. Since it opened, the system has never stopped getting bigger. Long term plans are for the monorail to be over 40 km in length, and this will most likely be surpassed. Building upon the knowledge and experience of the Shonan Monorail, the Mitsubishi Company built this dual-tracked system to connect suburbs in the Chiba Prefecture with Chiba's main rail station downtown. It is currently the world's only dual-beamed Safege-type system. It also has a spur line off the main line, another example that monorail switches work fine. One of the reasons Chiba officials selected Safege was because of the occasional inclement weather of the area. With Safege, the running surfaces and train bogies are protected from the elements inside the beams. Alweg-type monorails need either heaters in the beam or shovels on the fronts of beam during heavy snow or ice conditions. The downside of the Safege system is the larger size of the beams. A Texas-based company named Aerorail is proposing a smaller-beamed, higher speed version of Safege using steel rails (see Links page).